I suppose that my today’s vision has developed from a colorful past. Apparently I refused help from the age of 2. Nobody was going to carry me up or down a mountain! My grandfather together with a business friend, created the first cement factory in Switzerland. When they did the first tests in a wooden building with very hot furnaces, the noble friend drank a cold beer, which was lethal. On his death bed he called my grandfather asking him to look after his family. My grandfather was the centre of the community. During the European general strike he called the village together, announcing that they would work and not strike. His sons would take horse and cart and get food for the whole village. Grandpa was also high in politics in Bern. He is in the “Book of Pioneers”. He was at the root of the Swiss Cement Industry which today is involved in the cement industry all over the world. He was “a man of honor”, yet he was always humble. I was very fond of him and we were true friends. My mother was of French tongue, my father from the German part of Switzerland. We were raised bilingual. In September 1938 we immigrated on a German liner to Argentina. On that journey we learned the difference of civil rights. A Jewish family was emigrating from Germany. We played with their children. Before the waters of Spain a low boat stopped next to our liner, the Jewish family was taken back to Germany. We know what happened to the Jewish people in Germany at that time. In Argentina we learnt Spanish. At the beginning we stayed with the family whose father had enticed my father to emigrate. The children had a bike, one bike to 6 children! When it was my turn I broke away, chose to follow a tram line to help me find the way back. I ended at a wall, which must have been the wall around the oasis. I lost direction, which had always been my weakness. Not knowing what to do I cried. A man came and must have asked me questions in Spanish, I did not understand. He brought me to a house where a family with two children were having lunch. They gave me a drink of water, they spoke German and asked me to write the name of the family we were staying with. Welkerling was difficult to write, as it was German, and my schooling had been in French. However the children went to the same school as our host’s children. I am still today convinced that at the wall I met my guardian angel. Argentina did not work out for my father. We went back on a French liner. We toured Paris and witnessed that the precious stained glass windows in Cathedrals were being packed away as the war was imminent. Back in Switzerland we first stayed with my grandparents while my father was trying to find a new situation for us. During that time a hotel company was trying to acquire the meadow at the Lake of the four Cantons, where in 1291 the Swiss people of the first three Cantons by night met and “swore in the name of God” that they would stay free and never bow to the power of people”. A solution had to be found to protect that land that it could never be individually owned. It was decided that the schoolchildren would buy the land with their pocket money, to which my sisters and I proudly contributed. There will always be schoolchildren, they will grow up while other schoolchildren will come along and that will never end. 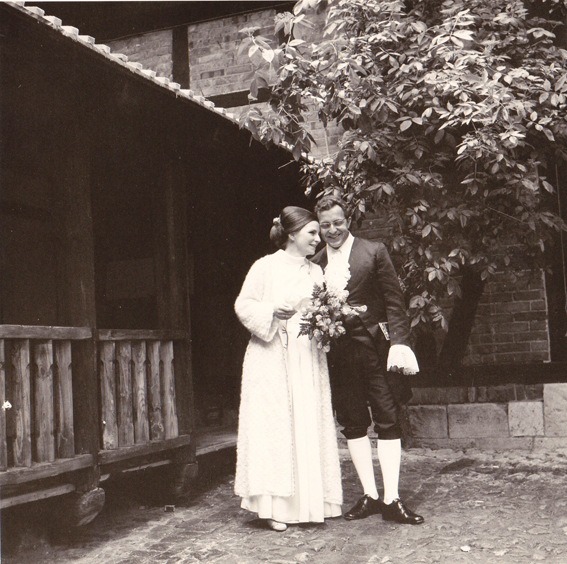 My parents decided to move to the German part of Switzerland, as my father, who was an architect and Master Builder was asked to urgently takeover the construction business in which he had worked after the first world war. The owner had had a stroke. It was July 1939, the war was moving closer and Switzerland was going to be surrounded by warring nations. We had no access to ports to import food. We could feed ourselves for 9 months. Storage facilities had to be built in the mountains . Our business had to surrender the lorry, the car, the petrol, copper, tyres, etc to the government while there was so much work to be done! The men had to go to military service, all the parks and flower islands in the cities were starting to grow wheat, potatoes, etc. My father was Catholic and my mother Protestant. In the French part of Switzerland Sundays were very special, as the whole family went to the Catholic Church for Mass and afterwards to a coffee place for a croissant and hot chocolate. In the new village, Sundays became a problem as people started to ask my mother whether she intended to convert. She never came to church with us again. I had religious problems as my inner revolted. At my first communion I really felt my bond with Jesus. However, in the afternoon we had to go back to the church and “re-state” our attachment to the Catholic Church by promising to go to confession and communion every month. I understood that if I promised that I would be burdened by a bad conscience for life. I was 9 years old! In the course of time the family had grown to 7 children. My father started to collect stamps, art, books, French Wine, you name it. The church exploited him for money etc. One day we had the visit of a business gentleman from London. He was a Russian Jew who after time became my mentor. Before the war he had lived with his wife and daughter in Berlin. As of 1938 the Hitler regime became very scary, he decided they had to move. His wife insisted to go back to Russia with the daughter. Boris decided to go to London. When he visited us, we took him to a beautiful mountain. There Boris gave me his newspaper that contained an article about the Russian writer Pushkin. I started to take Russian lessons and cherished that newspaper. I believe that I reminded Boris of his beloved daughter he missed so very much. He said to me:”If I can give you something for your life it is “give”. If you have time give time, if you have money, give money, if you have love, give love. You will always be looked after. This gift has accompanied me through life. To a top Swiss Banker he wrote a poem for this man’s 60th birthday. One sentence I remember: “In pursuit of the glitterings of life we are often bypassing life”. My father’s interest in paintings, brought us children into precious contacts for life. For me one painter and his wife became a very important shining light in my life. Cuno Amiet had been member of the French and German art circles. He had walked all through Switzerland to find his wife. In a small village away from the big roads, with lots of meadows with apple trees, a very quiet atmosphere, he walked into the local pub for lunch. Towards him came a young woman in Swiss National Costume. In her he recognized his future wife. They settled outside the village, where they bought an old farm house. From there he created the most beautiful paintings. By that time I was around 16 years old. I was twice invited to spend a summer holiday with them. With them I experienced what a valuable partnership they had. That is what I wanted in my life. I had to pray 23 years to Almighty God to guide me to the husband he had chosen for me. All my siblings studied with financial support from my parents. One sister went to Art school where she did very well. But then she chose music and did one degree after the other, piano, organ, carving and teaching bamboo flutes, dancing etc. until she was 35. I decided to go my own way, earning my money first. I finished my school years with a business course. My first job was in my father’s construction business. I loved it. We mainly did industrial building. My father travelled frequently and said I had to learn to take responsibility. We had a large number of workers, many Italians so I learnt Italian. I had a very good relationship with our workers. After two years I took some time off to study English in London. I had an uncle in London’s Swiss Bank Corporation. After a while I told him that I was learning nothing in the English course for foreigners I had attended. He had a client who was looking for an au pair for his family who was in the country. I saw this as a brilliant opportunity, as I know that children will not accept an English that is not perfect. After nine months I went back to London to study business. After a few months the main professor in the English business course asked me a tax question which I could not answer. He scolded me in front of the whole class, saying that my father would be paying taxes to the English Crown and I had no answer to this question! I apologized telling him that I am an overseas student. He could hardly believe me. Thanks to the children my accent at that time was perfect. I went back to work with father. I enjoyed the building atmosphere. I was on all the building sites. My father owned a fairly big garden near the railway station. It had beautiful fruit trees. It was originally owned by Nestle who started to boil milk in our village. When the farmers decided to raise the milk price, Nestle moved their enterprise to Vevey, on the lake of Geneva. Their shares are still registered in my village. As the garden was not managed very well I asked my father to let me use it. I bought sheep, learnt to shear them, asked some workers to build a stable for the winter. The rest of the year the sheep enjoyed pulling the branches of the trees to enjoy the peaches, apples and pears. This garden gave a lot of pleasure in the vicinity. After a few more years in business with my father I became Private Secretary to Stavros Niarchos the Greek ship owner who was developing the biggest commercial fleet in the world (he was the brother in law of Onassis). I was confronted with the very big international business, the shipping crisis in the Suez Canal, the stock exchange reports that would arrive at midnight from the US. I spent time in his Chateau in Paris, where Mrs. Niarchos unpacked the furniture of Marie Antoinette she was collecting. During the Suez crisis we received telexes as long as our office! During that time my Swiss home town decided to introduce a land tax! The tax register was open to anyone to consult. The main industry was a very low tax payer. But their finance manager held the finance department and their Industry manager was head of the government’s development department. At that time only men had voting rights. I was convinced that the men would say that this tax would be ok because it would punish the rich. They did not see that the set up in the local government was preventing a work choice. Any major employer was rejected from setting up business there. Not having a vote I occasionally used a locally sounding male name to make my views known in the newspaper. I did so from my Paris Office. The land tax was blown out of the way! Stavros Niarchos also had a 30 room villa in St Moritz, Switzerland, the playground of the world’s richest people. He had bought this villa, situated at the foot of the mountain, from the Prince of Romania. One of my tasks was to renovate this house. In that house was a large room that had been used as a bar. It looked unfriendly so that nobody wanted to use it. I invited a Swiss artist painter who had created some exquisite interiors. He turned the room into a “commedia del Arte”, painted on a light grey background. His brother who was a cabaret artist, he painted the frames around doors and windows. With specially designed and printed light rose silk curtains with a pattern of guitar ribbons and falling leaves, an orange silk covered sofa, on the floor white shepherd rugs, the room had been turned into a treasure. It was the most beautiful autumn. We sometimes went all three into the mountains, just to enjoy the scenery, often waiting for the appearance of a very shy marmot. We felt so wide and blissful. A very special treat for the housekeepers was an afternoon collecting buckets of blueberries! I said goodbye to the ship owner. He said to me: “If you ever need me you know where to find me”. I moved to Zurich, where a five day job with free weekends was very difficult for me. I started to take singing lessons every day including Saturdays, and a ballet lesson once a week. I decided to become an opera singer. However, one day at singing we had the visit of the Buenos Aires’ Theatro Colon Intendant to whom we auditioned. I was the last one to sing for him. His comment for me was: “How long has this lady been singing?” That is when I learnt that one does not always get the right guidance from a teacher (with self interest). I had been told that if I was not exceptional she would not teach me! But the five years were not all wasted. At Ballet I met a young mother who was in Subud. I joined. One day, after latihan, we all went to one of the helpers where we met Varindra who was visiting. I was asked to serve him tea. He looked at me and said: You should go to Wolfsburg! I went and a new development started. In Zurich I had worked with an international bank. I had even introduced new clients to them. With a top quality interior decorator I created two very elegant reception rooms for clients. I learnt a lot from him. When I left that bank for Wolfsburg I was given my own bank stationery and business cards as well as a brand new red IBM typewriter (and a brilliant salary) to attract clients for them. It was the time when Bapak’s talks came directly from Belgium to Wolfsburg to be transcribed and then published in German. I had brought with me a recording machine (a gift from Dean Dixon, the conductor who at that time had proposed to marry me) I used this gadget to transcribe the English translated talks to then be translated into German. However, after a few months I remembered that the typewriter was really meant to be used for business. I had a few clients in London. I spent maybe a week there. One day, in Oxford Street I felt very queer. It was my indication that I had to leave the bank. The only work at the time in Wolfsburg, according to the helpers, was to be Lienhard Berger’s secretary. Lienhard was fairly new at Volkswagen, starting a career there. His office was behind glass and I sat in a very large office with lots of people working at individual desks. That was my total purification, with all the sleep deprivation in the Subud Group. Maybe it was my purification before my marriage. It was all worthwhile for me being given the world’s best, kindest and very creative husband. I met Ludwig in the 1973 summer camp the Wolfsburg group organized in beautiful countryside. Ludwig and his young colleague one year built a huge tent city. I was asked whether I would like to hold the coffee shop. And how I would! Ludwig had a very difficult building site some kilometers away. He came to the tent only at night and weekends. I realized that sometimes I served him quicker than others in the queue as I thought he must be tired. The National Helpers sometimes put the two of us on the last night watch together. We were so tired. We sat in the grass and when we opened our eyes we saw that the cows were watching us. One night I said to him: “you are so quiet. He said: “yes, I am thinking whether we should get married”. It was so clear to me that Ludwig was the Man I had been waiting for. We did not have much time to get to know each other. His young partner refused to take care of their very difficult building sight even for three days so that we could go on honeymoon. 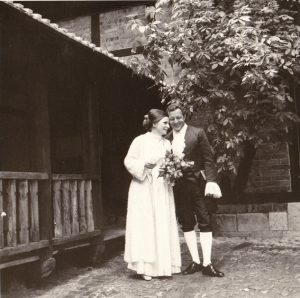 I said to Ludwig:”we do not need a honeymoon, when we will be married we will travel and every time we will say:”we are going on honeymoon” and that is what we did. Ludwig and I spent years together in Saudi Arabia, where I was very lucky to be given a job as secretary to the Swiss Ambassador. Ludwig had a gigantic commitment supervising the creation of a huge Olympic size swimming complex. Every weekend, with his colleague who was in charge of the sports complex, we packed our cars to spend a weekend (Thursday lunchtime to Friday evening) at a totally intact reef, deep see diving. Occasionally some overseas Subud friends visited us to do the pilgrimage to Mekka from our house. After the project was finished in Jeddah, we had a similar project in the mountains of Mekka. When our commitment in Saudi was completed we had a short three weeks before Christmas in war torn Iraq. We were promised to go back to spend Christmas with family. We had to return to Bagdad on January 3. The taxi was at the door to take us to the airport when the telephone rang. The German Company said that I was not to go back to Bagdad with Ludwig. Within seconds we were literally torn apart. Almighty God has so many ways to conduct our lives! At the end of January news reached me at my mother’s in Switzerland that Bapak would like Ludwig to guide Anugraha to completion. In Bagdad a German Subud couple managed the Meridian Hotel. I had their telex address. Ludwig went there at weekends for a rest and some food, as food in Bagdad was hardly available due to the war. Had we both been in Bagdad, Bapak’s message would not have reached us. Ludwig returning to Switzerland first needed hospitalization to fix his intestines as food during the week in Bagdad for him was simply not available. During Anugraha I was Sharif Horthy’s secretary. Every morning I went to Villa Rahayu to pick up the work Sharif wanted me to do. I entered through the kitchen. Mostly Bapak was there with Sharif and members of the family. I said “Good Morning” and quickly walked on as I did not want to disturb Bapak’s environment. Today I am sorry that I was not friendlier. After Anugraha we planned to spend a few weeks with my mum while we tried to find a new project. 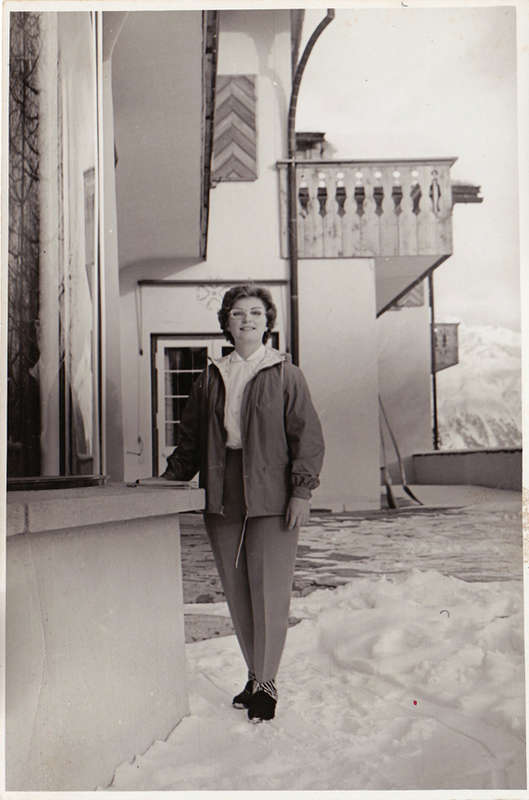 My mum, widowed, was quite well and happy, although now alone in a house that had been home to a large family. Ludwig, on the third floor started to design a cluster of hexagon building units. I spent my days mainly with mum. We were not allowed to invite friends. We occasionally went to have a beer at a pub! I am still admiring Ludwig’s patience and acceptance. After 7 months mum was able to pass away peacefully. I told my siblings that I needed to inherit the house as we were homeless and practically also penniless. We renovated the interior and turned the house into a very successful gallery. We even had “Mr. Aldi” flying in from Germany, renting a car at the airport, driving to our gallery situated in a village a good hour away, choosing 4 oil paintings from his favorite Swiss painter, drinking a cup of tea with us, driving back to the airport, flying back to Germany! We were able to create an extraordinary atmosphere in the gallery and it became very successful, while other galleries were folding. Ludwig had a Subud Helper brother who came once a week from 75 km away to do latihan with him in our house. One evening he arrived, entering the house he said to Ludwig:”it is heavy here”. Ludwig returned:”tomorrow I will go to Lausanne”, where there were three helper brothers, all of French tongue. I worked in the town next to us where Ludwig had to change trains. I met him at the station and said to him; “go as far as you need, I am attached to nothing as long as we stay together”. Ludwig came back, almost with tears in his eyes he said:”the test said that it is Australia!” When it was in the papers that the gallery is closing the bank manager came all upset saying: what happened, you are leaving? We came on a one way ticket to the Sydney World Congress 1989! We settled ultimately in Redland Bay. Ludwig created and built a house consisting of octagon shaped units around an octagon shaped swimming pool. We had a majestic view. In 2006 we travelled to India to take part in the Bangalore Subud Event. He came home with a terribly painful attack of shingles all over his face. I had to hospitalize him. That experience changed him. He became very peaceful; he still worked on renovating and extending the neighboring building. At night he would listen in the dark to his favorite classical music. At Easter 2007 we sat on our terrace, quietly looking over the sea when Ludwig said:”Aren’t we lucky, God has guided us so well, we have reached everything”. He had said to Victor Boehm who visited us after the Byron Bay Congress that this house would be his last project. Three days after Easter he fell from a very high ladder at this building site, and he peacefully passed away at the hospital. Before, two doctor’s had come to see me in the waiting room. They said it was very serious (telling me really that they could not save Ludwig). They said that they would do anything I wished. I said “that my husband pass away in my arms”. But when I held Ludwig I felt that he was not there anymore, he was simply breathing through cables. I said to the young doctor that she could unhook the cables. Afterwards I said to her:”This is not an accident, this is an act of God”. She said: “I know”. Why do you know? She said:”he did not fight!” 6 months later he would have celebrated his 70th birthday. He had a son from a previous marriage who I had a very special connection with. He came over from Germany as we had planned to surprise Ludwig at his birthday. He asked me whether I would consider adopting him! What a blessing and a big gift to both of us. Soon after Ludwig’s departure, Rukman Hundeide, the creator of ICDP, invited me to take part in a three day introduction course for ICDP that was planned to take part in Norway. I knew Ruqman when I lived in Wolfsburg. He had come to introduce his concept of ICDP. Already then I had the feeling that I would like to take part in it one day. I went to Norway with Alex, son of Roland Blauensteiner. He is a business developer. At the time he had his first baby and was very interested in learning about ICDP (International Child Development Program). With his business skills he was very instrumental in setting up ICDP in Australia. We now have a fully equipped Trainer, very busy using her skills within the TAFE institution. As I am a Board member of Morningside Care, we were able to install ICDP as a project of Morningside C.A.R.E. which has Sine Cera as another arm. That gives Subud Australia a tax deductible social project. Two years ago, in a creative weekend in Gunebah, we tested: ¨Who am I? I received that I am a pilgrim! Ludwig and I were founding members of the Kalimantan School. Ludwig developed the Brisbane Subud House, also adding a house for the children, so that men and women could do simultaneous latihan. We created the Subud Sunday Soup table as an ongoing Susila Dharma project supporting the education of 5 children at the Mithra Foundation in India.